If you've read my articles on Drill Dozer (article 1, article 2) , you should be well aware that the biggest set back for the game is that the primary mechanic DRILL frequently creates static space. Because the DRILL mechanic is designed after a mechanical power drill, using the mechanic is about as engaging as holding down a button and waiting for the object to fall apart. Luigi's Mansion features a similar mechanical primary mechanic: VACUUM. This mechanic includes operating the Poltergeist 3000 forwards and in reverse. Unlike Drill Dozer, Luigi's Mansion successfully designed its mechanical mechanic to be engaging for the player and feature a considerable amount of interplay in the process. Before I can fully explain the superior design of the VACUUM mechanic, I have to first explain the core gameplay design of Luigi's Mansion. If you haven't played/seen the game before, then check out this video. Skip ahead about 4 minutes. The game is set in a series of dark environments. To properly navigate, players use the LIGHT mechanic to illuminate the surroundings. Meanwhile, semi transparent ghosts close in on Luigi's position in order to deliver a close quarters punch. Though the VACUUM range is fairly long, players must surprise these ghosts making their bodies and hearts vulnerable for VACUUMing. To surprise ghosts, players have to LIGHT them up. The closer Luigi is to a ghost target when the light first shines on it, the greater the amount of time the ghost will be stunned in surprise. Once stunned, players must quickly switch to the VACUUM mechanic to begin sucking up the ghosts. Here's where things get interesting. To successfully stun ghosts, players must use the LIGHT mechanic at a close proximity. To do this, players must obfuscate the target in darkness until the prime moment. Essentially, this interplay is like having to catch the boogie monster in the closet by turning on the closet light and not the bedroom light. In other words, one must bring themselves closer to the terror/danger to properly deal with it. Likewise, in Luigi's Mansion, there is interplay between playing in the light and darkness to effectively deal with the ghosts. While sucking up a ghost, players must tilt the control stick in the opposite direction that the ghost is struggling in. The interaction between the ghost frantically fleeing in ever changing directions and the Luigi being dragged around the room creates a sort of tug-of-war interplay. In this struggle, players must keep track of Luigi's position watching out for hazards like other ghosts, banana peels, bombs, etc. Functionally speaking, the VACUUM mechanic as well as the flash LIGHT mechanic in Luigi's Mansion are projectiles, which means they potentially suffer from the drawbacks of projectile based gameplay. Fortunately, Luigi's Mansion cleverly avoids such drawbacks. By having to move close to ghosts to effectively stun them, and being tethered by the suction power of the VACUUM mechanic all of the common drawbacks from projectile based design have been organically avoided. The interplay is what makes Luigi's Mansion's mechanical primary mechanic create less static space than DRILLing in Drill Dozer. This accomplishment is due to the creativity in how the game defined the uses of the VACUUM mechanic. The sucking action functions as an extended arm for grabbing items, a pull, an investigative search of objects, and a rope for tethering Luigi to his unlucky enemies. Throw the whole thing in reverse, and the VACUUM mechanic turns into a sort of gun able to emit and even launch elemental based projectiles. The shear creativity and variety of this singular mechanic allows players to dust, investigate out of reach objects, light candles, extinguish flames, catch ghosts, pull keys down from out of reach shelves, rotate fans, steal food, play pool, and a multitude of other intuitive activities. In Drill Dozer, the DRILL mechanic does little more than drill and eventually destroy things. Despite the lack of interplay with the DRILL mechanic, the lack of creativity and variety of the mechanic keeps the majority of the gameplay relatively flat and predictable. Players drill into walls, lockers, toilets, enemies, and obstacles, and after a few seconds they're all destroyed crumbling away into nothing. Sure, the DRILL mechanic is also used as a grab, block, door opener, and shield, but even these creative uses are limited by the undynamic design implementation and the nature of the input for the mechanic. When the player only has one or two gears, the amount of DRILLing time has an exact limit. In this way, any part of a level that's designed for prolonged use of the DRILL mechanic is also designed so that the limited DRILL time is still enough for the player to progress. Furthermore, the DRILL mechanic can be used infinitely taking away any possibility to implement a penalty for failing to account for the DRILL mechanic's time limitation. When the drill runs out of juice, a quick repressing of the button will start it back up again. No need to worry about anything like overheating or burning out the motor. And when the players find the 3rd gear, running out of juice is no longer an issue. Because of these limitations (or lack thereof), the gameplay never layers together with the DRILL primary mechanic. Most of the game's challenges are simply a matter of completing the task the one possible way the developers have desigend without much variation or room for player expression. Furthermore, players activate the DRILL mechanic by holding down one of the shoulder buttons. Once held down, the player has do little else to continue DRILLing at maximum effectiveness. Though the shoulder buttons must be quickly repressed to shift the gear from 1st to 2nd gear and then again when shifting into 3rd gear, the timing window for this action is very large and therefore very forgiving. Additionally, the timing for these shifts are always the same. Players quickly memorize the unchanging rhythm of these shifts thus somewhat reducing the engagingness of the mechanic. Perhaps different densities of materials should alter the gear shift timing. Or perhaps enemies should have a way to throw off the shift timing windows to create some interesting interplay. Unfortunately, the way the DRILL mechanic is currently designed, the majority of actions in the game are fairly static and repetitive. Once again, Luigi's Mansion has the design upper hand. I've already discussed the dynamics and interplay of the VACUUM mechanic. Now I'll discuss the nature of the input for this mechanic and how the basic set up of Luigi's Mansion alone puts it in a design position to create more dynamic and engaging gameplay than Drill Dozer. As a launch title for the Nintendo Gamecube, Luigi's Mansion ushered in the new age of 3D games from Nintendo. 3D is much more complicated than 2D. When designing games in 3D, the easiest element to overlook is the camera. To Luigi's Mansion's benefit, the camera design is simple. Though the game is in 3D, the game is set looking into a each room from a fixed "doll house" like perspective. Luigi is free to move around in a 3D environement, but the camera is stable like a 2D game. Continuing what the N64 started with 3D controls, the Gamecube controller features 2 analog control sticks and 2 analog shoulder buttons. Taking advantage of the new analog control possibilities for 3D games, Luigi's Mansions features triple analog controls. The strength of the VACUUM mechanic is controlled by how hard the right trigger is pressed. When expelling elemental matter, the click at the end of the shoulder trigger sends out a projectile. Not only is VACUUMing a more dynamic mechanic than DRILLing, but it's more interesting because of how engaing VACUUMing is when combined with Luigi's supporting secondary function MOVE. 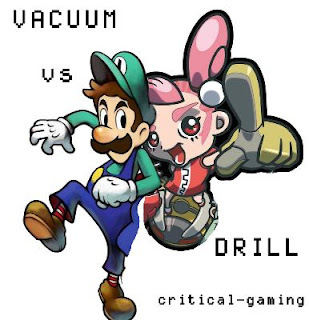 If DRILLing in Drill Dozer is like throwing up a ball into the air and catching it over and over, controlling Luigi and VACUUMing is like a deft juggling act managing three different size balls in a variety of pleasing ways. Where Drill Dozer is "trapped" in a 2D space, Luigi's Mansion's 3D world adds a new dimesion to aiming and using the primary mechanic. 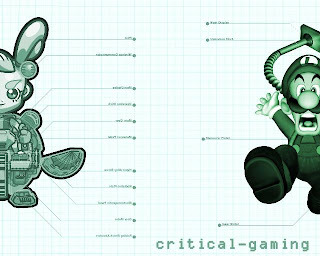 Comparing Luigi's Mansion to Drill Dozer makes clear the effectiveness of mechanics, the inputs for the mechanics, and how 3D design can upgrade the core design of a game. Perhaps now it's clear why I critique controllers and mechanics in "next-gen" games so unrelentingly, and why the Wii and the DS are my platforms of choice for my gaming future.